The old was fading away but I often felt like I had no solid ground under my feet. I knew I was entering new worlds of consciousness and becoming familiar with my intuitive self in so many ways. But I had no way to know if there was a safe landing anywhere. Like the Fool card in the Tarot – sometimes you just have to jump off the cliff into the unknown with no assurance of a parachute. Trust. I got familiar with whole new levels of that word. And I knew the plants I was connecting with were there to help me even if I didn’t know how they worked. They were increasingly making their presence known to me. I do remember feeling much better after doing this painting. One of the ways that art works its magic is by giving us a visual image of what we’re feeling – especially if we just let the paint flow without a preconceived idea of what image will appear. I continue to stare at it for comfort when I am in one of those bleak places that arise again and again. Oregon Grape, a plant given to me by Judy Bluehorse Skelton and Vivi Tallwoman, tells me it is about truth, about coming into true. A fitting ally for my process. 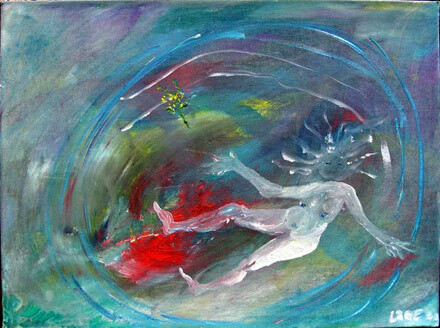 Journal 4/26/00: The painting ended up being me in the maelstrom. In the eye of the tornado/whirlpool that has come up in my paintings over and over. But it is no longer just in the painting. It is the painting. Yet she is not alone. In there with her – though just out of reach – is a sprig of Oregon Grape, Mahonia Nervosa. Yellow flowers that are the ally – the friend. The good medicine for the journey – the fall, the letting go into the mystery. The pull of the unknown has become inescapable. The body’s ploys for safety no longer hold. “The force that through the green fuse drives the flower”says Dylan Thomas….We are the flower in the green fuse.